Velvet like material in front, satin material in back. ties in back, with a bow ribbon, and has a zipper on the side under armpit. 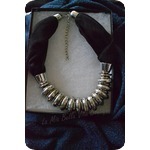 This chunky necklace is soft around the neck made in a black soft fabric. 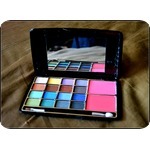 Brand new cosmetic pallet from FANTASeas contains - eye shadows, blushers and an application wand. Beautiful pair of Burmax Stainless Steel Thinning Shears. 96 S from Pakistan. 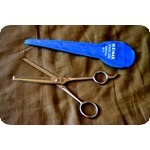 Top notch tool for hair styling! 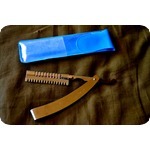 The Burmax Hair Shaper Straight Razor with Blade is such a handy little tool! I bought this for beauty school, and only used it once on a mannequin. Comes with small blue carrying case as shown in picture.